Kinetik Wellbeing’s Automatic Upper Arm Blood Pressure Monitor is the easiest way of regularly monitoring your blood pressure. The monitor uses novel technology that facilitates blood pressure readings during cuff inflation, meaning pressure is quickly relieved once the measurement is taken reducing the pressure exerted on your arm. The monitor’s quick reference indicator provides an easy to understand, classified reading. Up to 90 readings can be logged by the system, providing users with a blood pressure record that can be shared with your physician. 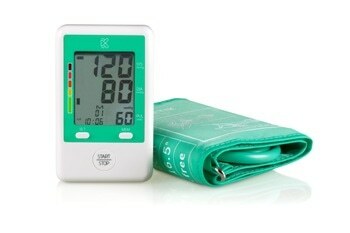 The measurements taken by the Fully Automatic Blood Pressure Monitor are scientifically valid. The system adheres to European medical device regulations as a Class IIa Medical Device, meaning users can be certain they are taking quality readings. Kinetik Wellbeing wants to provide the best value systems to their customers. If potential customers can find their systems for a lower price from any legitimate retailer Kinetik Wellbeing is happy to match this price. Kinetik Wellbeing is a partner with the UK’s biggest charity first aid provider, St John’s Ambulance, to provide their healthcare monitoring and management systems. This includes health kits, electric thermometers, blood pressure measurement systems, and allergy and pain relief.